Substitute “passions” for “pleasures” and the gulf in understanding yawns wider still. I am a strong opponent of “ever closer union” in Europe and look forward to the promised “in out” referendum, if it ever happens, but polls consistently suggest that the great mass of my fellow citizens do not care all that much either way (though they should). 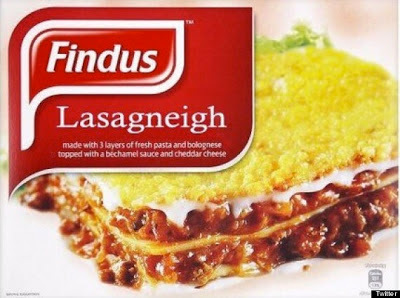 On the Horsegate food contamination scandal, media vox pops certainly found some consumers who were beside themselves with rage at the thought of unwittingly munching Dobbin in their burgers or lasagne, but many more received the news with a resigned shrug. Among other recent burning issues, I have not written about gay marriage because I really could not care less one way or the other. Nor do I regard it as a “scandal” that people who are lucky enough to own a house should have to sell it to fund their care home bills, so long as their partner is not rendered homeless in the process. While Scottish independence, though a lousy idea in principle, would have the great advantage of taking whingeing Salmonds, Sturgeons and other assorted fishes with chips on their shoulders out of our newspapers for good. Which brings me, inevitably, to the one issue about which I do feel pretty passionate at the moment: the despoliation of the matchless Northumberland countryside by the crazy wind energy subsidy scam (this century’s answer to the last one’s plague of subsidised conifer plantations – though at least we will never run short of wooden pit props for our thriving deep mining industry). Last week’s column on the planned Follions Folly attracted a small handful of passionate e-mails of support, one castigating me for failing to appreciate the beauty of wind turbines, and another pointing out that they are less ghastly than nuclear power plants. Well, up to a point, Lady Copper, though at least nuclear can produce large amounts of electricity consistently if not particularly economically, rather than relatively small amounts when the wind blows at the right sort of speed. And from the great mass of the public, I suspect, total indifference. Fuelled by the sense that covering much of the countryside with gigantic turbines is “inevitable”, like German victory in World War II or the triumph of communism, and “the future”. Which is interesting considering that they combine the mediaeval technology of the windmill with Faraday’s cutting edge invention of 1831, the dynamo. In my experience nothing is inevitable apart from death (we all know now that taxes are pretty much optional if you are rich enough to pay for the best advice). So I shall keep banging the drum for the total madness of wrecking a peculiarly beautiful bit of countryside, designated as of High Landscape Value and right on the edge of the National Park, just to put a bit of extra cash in someone’s pocket for the next 25 years. 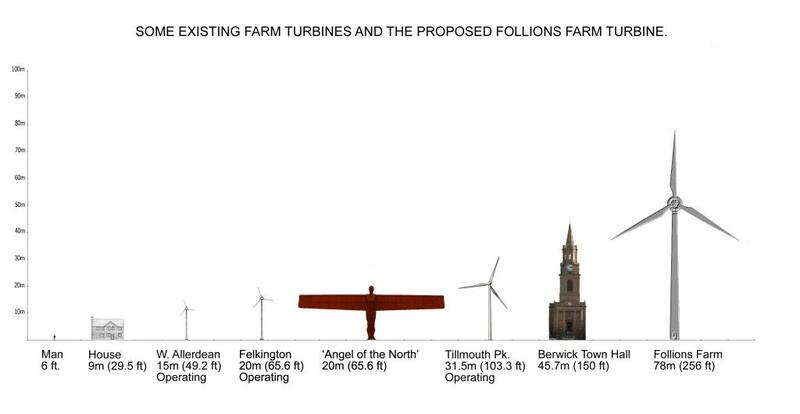 The last week has seen the creation of a website - http://www.fightfollionswindfarm.co.uk - and Facebook page, which both feature a rather more realistic photomontage of the development than the one accompanying the planning application, plus some interesting height comparisons with existing turbines and buildings. Do please take a look and “like” the Facebook page if you feel so minded. A public meeting has also been arranged at Whittingham Village Hall at 7.30pm on Friday for everyone concerned about the issue. 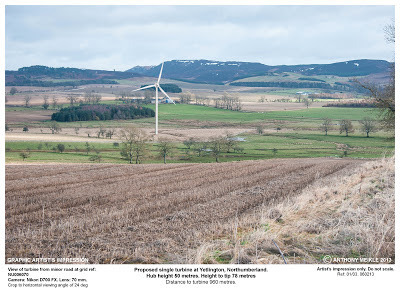 Curiously, the applicants’ agents have declined an invitation to come along and explain why the turbine would be such a good thing for us all. Suggesting either total confidence that they are going to get their way regardless of what the yokels think, or a contempt for the views of the local community that almost beggars belief. Perhaps, indeed, a bit of both. In a county that has already more than done its bit to help meet renewable energy targets, there can only be one sane response to opportunistic proposals for large turbines in beautiful, sensitive and remote locations. Just say no. Please.